Published: Nov. 25, 2012 at 04:39 p.m. Updated: Nov. 25, 2012 at 09:56 p.m.
Ryan Tannehill put together one of the best fourth-quarter performances we saw from a quarterback all season Sunday. The rally could have repercussions in the NFC playoff race for a while. Check out the best photos from the Week 12 matchup between the Seahawks and Dolphins. 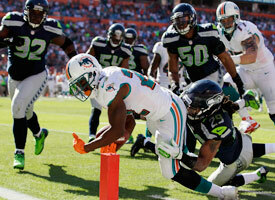 Tannehill led the Miami Dolphins to 17 fourth-quarter points to beat the Seattle Seahawks 24-21. In the final quarter alone, Tannehill led two 80-yard touchdown drives and a 65-yard, 92-second drive to set up a game-winning field goal by Dan Carpenter. We expected this to be a defensive game, and expectations were met early. There were just two first downs in the first seven drives. But as the game wore on, it turned into a showdown of two very promising rookie quarterbacks. Russell Wilson also played well, completing 16 consecutive passes at one point. But the Seahawks couldn't close. They had the ball at the 40-yard line with just over two minutes left in position to break a 21-21 tie. The offense went backward on the next three plays. Tannehill took over at the 10-yard line and made it look easy. We've been big fans of what Tannehill has done this season, but this fourth-quarter performance was a surprise. The Seahawks' defense looked gassed and absolutely was manhandled by Miami. It's amazing Seattle blew a fourth-quarter lead despite a punt-return score from Leon Washington. At 6-5, the Seahawks are tied with the Tampa Bay Buccaneers and Minnesota Vikings for the final playoff spot in the NFC. Seattle had a chance to create some separation Sunday but continue to struggle to win on the road. The 5-6 Dolphins still have a huge mountain to climb, with upcoming games against the San Francisco 49ers and New England Patriots. But this game shows the resolve of Joe Philbin's team. The Dolphins have overachieved, and they have found their franchise quarterback. Tannehill will have ups and downs because he's young, but he has shown that he's going to be a good one.